Yes, we know – you’ve heard the ‘good skin starts from within’ line a hundred times and just want to have a Diet Coke and takeaway without feeling like you’re committing a crime of heinous proportions, so instead of reiterating what we know to be true (and that spot you get the morning after an ice cream binge speaks for itself, anyway), we suggest an addition of a skin-loving supplement. The beauty desk have this week discovered Thalgo’s Collagen 5000, which contains vitamin C to brighten, selenium to reduce oxidative stress and the hero ingredient collagen, which plumps and improves suppleness; take it daily and the odd naughty meal won’t show in the form of wrinkles and spots. Fake tan is a big fat faff, right? The period of looking like an oompa loompa while it develops, the propensity for it to go catastrophically wrong and the wretched smell of the stuff is all enough to put most of us off. 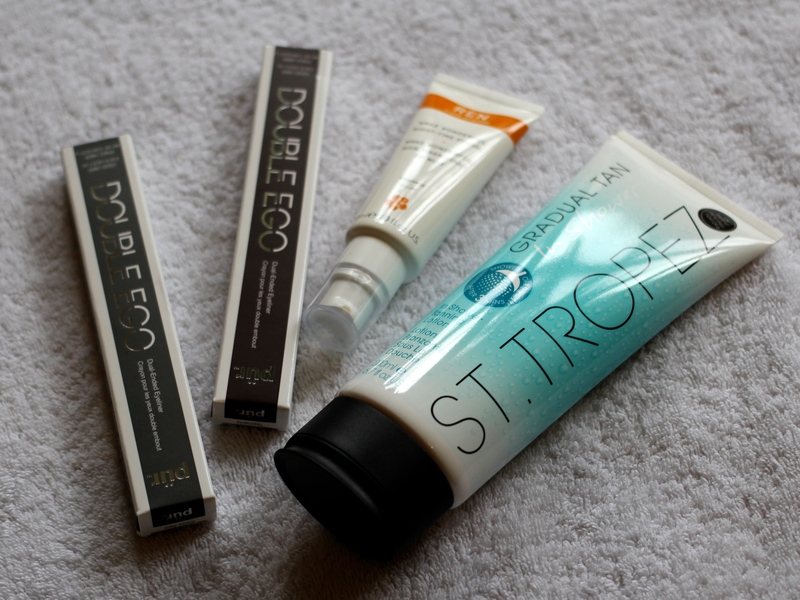 But of course tanning giants St. Tropez cottoned on to that, and in answer have formulated In Shower Gradual Tan. Here’s how you use it: shower as normal (with shower gel/exfoliant/however you generally go about getting clean), then turn the water off and apply a generous layer of this to your body. There’s only one annoying bit: you’ve got to wait three minutes for it to take, so bring your toothbrush into the shower and get brushing while it does its thing. After that, just jump under warm water, pat yourself dry and expect a subtle tan to emerge (FYI: this is a gradual one, so you can use it every day if you want to build up intensity). The colourful variants of the smoky eye have had the beauty desk rapt for a good few months now, and we have come to believe no make-up look suggests sophisticated and assured like a hazy grey smoke or emerald green. PurMinerals are therefore onto a winner for us with their Double Ego wands. On the one side a liquid eyeliner and on the other a soft pencil in the EXACT same colour, this is how to get your eyes popping on the go. Milkshake’s Whipped Cream Leave-In Foam had us at the whole 12 in 1 thing – we’re always on the eye out for a multitasker. When put to the test, this delivers on its promises: the light mousse that’s saturated with milk proteins (hence milkshake) leaves hair softer, shinier, stronger and not a little bit crunchy. Based on that, we’d guess that it holds true on other fronts over time, too, which is jolly handy, given that we’re now on our way into summer and could do with one product that’ll maintain condition, protect from UV damage and style. Another multitasker (yes, a pattern is emerging), Maybelline’s All in One Dr. Rescue nail polish doubles up as a base and top coat, as well as fortifying nails. We also are impressed with its staying power – one member of the beauty desk who is fond of a sneaky peel off of polish reported that after three days it hadn’t lifted at all in the corners, providing no opportunity to pull it off. REN does it for our skin. Their new addition, Wake Wonderful Night-Time Facial, is equally as pleasing as the rest of the range: two uses pitched our complexions into ‘we’ve had 8 hours of sleep and drink coconut water only’ territory. Designed to go on after a serum and pre oil/moisturiser, the combination of lactic and glycolic acid, omega 3 and yeast fermentation agents (fear not: your skin loves a little yeast), work in synergy to exfoliate and brighten while plumping and reducing wrinkle depth. And you know what that adds up to, don’t you? Le glow.